On every self-respecting cyclist’s Bucket List, Mont Ventoux is a must if you are in the area. We know the ‘Giant of Provence’ intimately and we’d be happy to assist you with a supported ride up this epic climb. Prices depend on needs/number of riders, but as an example, a fully-supported climb for two riders starts at €125 per person. For the ultimate one-day cycling challenge, join the exclusive Ventoux Triple club by climbing Le Géant from all three sides. We will be with you every pedal stroke of the way – €225 per person (for two riders). 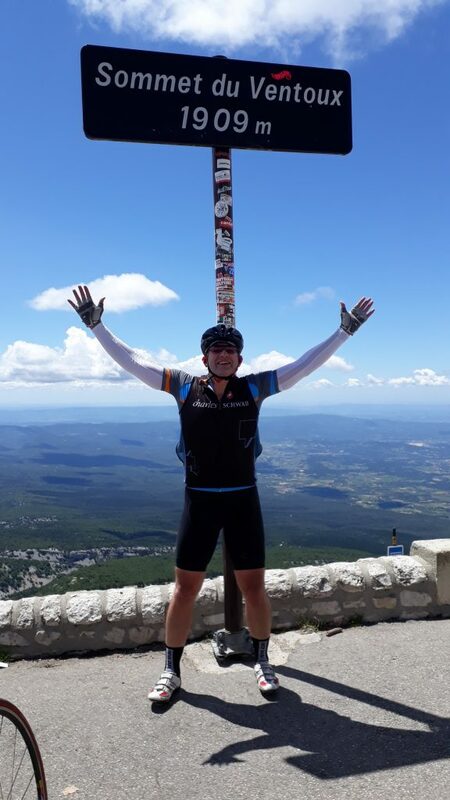 *If you are in the area for a few days we have a fantastic 2 or 3 day cycling package, centered around a Ventoux climb, with 1 or 2 guided rides in Provence to round off a perfect long weekend! Check out our Ventoux BreakAway Tour page for more details. We’ll pick you up right after breakfast at your hotel and either warm up with a ride to the start of the climb, or transport you and your bike there. After a ’briefing’ on what to expect on your climb, you’ll hit the road. 44|5 will be waiting every few kilometers on the climb to offer support, encouragement, water and food. After a successful climb, we’ll be at the summit with warm clothes for the descent, and of course, a few photos at that famous sign! After descending the mountain, you’ll either ride back to your hotel, or we’ll transport you and your bike. Fanstastic ground support for the Club des Cingles Mont Ventoux Triple challenge for The Air Ambulance Service. Couldn’t have completed it without their assistance. Everything sorted for us from arrival at airport, nice hotel sourced, excellent ground support on the day which included nutritional and motivational support. Very helpful, friendly and fun!